If the more extreme, adrenaline pulsing, water-skiing adventure isn’t what you’re in the mood for, paddle boarding is a beautiful way to enjoy lakes and calm oceans in a soothing, almost meditative way. Fresh air, calm waters, gentle movement: the combination is a zen-like endorphin bath. On what was a stunningly sunny BC day, the wonderful team at Access Revolution introduced me to the Onit Board, an adapted paddle board that allows anyone of any physical ability to get on the water and enjoy the relaxing pastime. After transferring onto the Onit Board chair, a person is easily rolled onto the paddle board which is equipped with two outriggers that make the Onit board about as flippable as a flat bottomed rock. All jokes aside, it really is phenomenally secure. You’re not going anywhere on that thing. Then, either with an Access Revolution guide on the board behind you to help if you’re tired or have limited upper body mobility, or if you prefer to go by yourself, you’re eased out onto the water to begin the serene journey that is paddle boarding. in the power of community and that everyone should have access to the healing, bliss, thrill, awe and fun that takes place in the great outdoors. She’s super fun to work with, and her love and energy for the outdoors practically glows from her, infusing those around her with the same excitement. Jordan is currently embarking on a worthy project, trying to raise funds to undertake a tour through BC in order to provide communities who don’t have the resources for accessible programs with the opportunity to try paddle boarding. If she is able to reach her ultimate goal, she will be able to provide one lucky community with their own Onit Board, and will be given the proper training from Jordan herself to ensure that the enjoyment of the outdoors remains accessible. Through my experiences of sustaining a permanent disability, and working as a personal injury resource coordinator, one of the most frustrating and saddening things I have seen is the lack of supports and opportunities in BC’s smaller communities. I would absolutely love to see this change, and I hope that she is successful in her endeavor. I know, without question, it will bring joy to people who need it. For an overview of the Access Revolution BC Tour check out their video below. If you happen to have a dollar or two to spare, or even a bit more, please consider supporting her campaign by donating at https://startsomegood.com/projects/access-revolution-outdoor-recreation-for-all/. I can tell you firsthand what a wonderful experience it is, to have the freedom to enjoy a sport that just isn’t possible for everyone to do without the generous help and support of people like Jordan and Access Revolution! 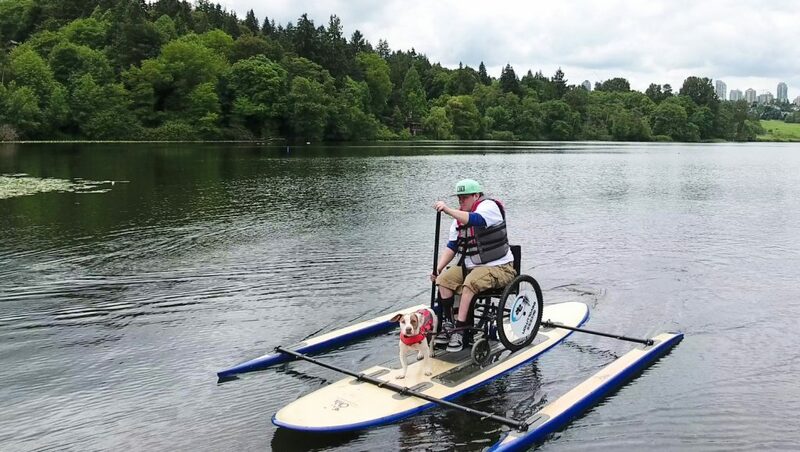 If you have a disability and would love to try paddle boarding, check out Access Revolution’s website and contact them to get a quote for a day trip!